You have been asked to sort out an issue between Rita and Brian. They haven’t been getting along at work for a while. You meet them for initial one-to-ones to get some background and prepare them to sit down and talk it out. But they seem a lot more dug-in than you had expected. They’re not ready to sit together and figure this out in a reasonable way. Brian is upset, hurt and very angry. And Rita finds it hard to move away from telling you how awful Brian is. You listen patiently, make murmuring noises. They continue to vent. How can you help them move out of their negativity? What would help them dissolve some of the hurt and anger so they could be a bit more ‘rational’ about it all? “One of the most practical courses I have ever attended. The model used provides you with a toolkit of skills that can be used immediately both professionally and as part of your own development. This should be a key management skill that every manager should have in their toolbox. Coaching people experiencing problems experiencing conflict or difficulties in work or family relationships presents particular challenges. We fall into a helpless, victim mindset and lose our sense of our own personal power. We see the other person as ‘making us feel’ a certain way. We take things personally. We see only our side of the story. We lose our objectivity and bigger-picture thinking. Upset and angry feelings cloud our judgement. 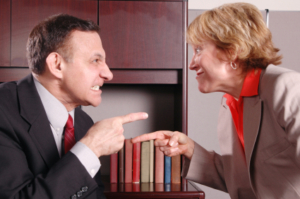 We are less resourceful or able to negotiate and talk things through with the other person. 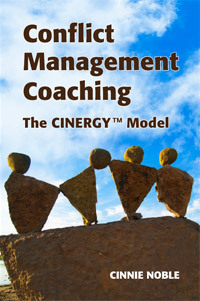 The CINERGY® Coaching model was developed specifically to address the emotional overwhelm that can sabotage our thinking and behaviour in conflict. Coaching with this model helps the client see their situation through a more dispassionate lens. This frees up mental and emotional energy so they can figure out a more strategic way of responding. They also get to explore any potential roadblocks that might arise and contingency plan around these. The theory underpinning the model is based on real life case studies backed up by cutting-edge research from the field of neuroscience and conflict resolution. It has proven effectiveness in assisting people to develop self-awareness and broaden their perspective on a conflict or dispute. “I found the four day course hugely beneficial, it has added a further skill set for both myself and the Civil & Public Service Network of mediators. The methodical approach and deep learning approach has allowed me to approach our clients with greater understanding and a more planned systematic approach. You learn in a supportive and encouraging environment. You learn step-by-step and practice with real life case scenarios. Your course Handbook explains every stage of the coaching model meticulously. It gives you specific suggestions and questions that guide you every step along the way. Most importantly, you get individual guidance and feedback from the Trainers to keep you on track. 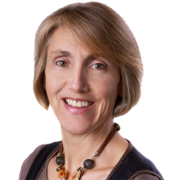 “I would highly recommend this four-day course, both for my self-development and for giving me a fresh insight to assist other people in managing conflict situations in their lives. This programme is for anyone who works with clients or staff caught in the ‘conflict zone’. This can range from preparing for ‘difficult conversations’ or performance reviews, to supporting people trying to rebuild a strained relationship pre- or post-mediation. Whether you are in a HR professional, a Mediator, Counsellor or Coach, whether you are managing a small team or a large school, this course will expand your skills and enhance your effectiveness. This is a practical course – two-thirds of your time is spent on coaching-practice on actual ‘live’ cases. So you leave after four days fully trained and ready to work with your own clients. And what’s more… you get coached on your own ‘hot’ buttons or issues that you might be struggling with. So you come away feeling ‘lighter’ and more resilient in managing your own personal life or work challenges. “Having travelled from the UK to attend this 4 day workshop in Dublin the bar was set very high in terms of my expectations. I found it challenging and highly rewarding.